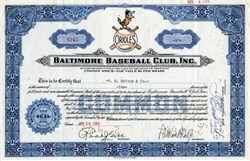 Beautiful certificate from the Balitmore Baseball Club, Inc. issued in 1965. This historic document was printed by the American Bank Note Company and has an ornate border around it with a vignette of Orioles logo. This item has the printed signatures of the Company’s President, and Secretary, and is over 51 years old. The Baltimore Orioles are a professional baseball team based in Baltimore, Maryland in the United States. They are a member of the Eastern Division of Major League Baseball's American League. One of the American League's eight charter franchises in 1901, it spent its first year as a major league club in Milwaukee, Wisconsin, as the Milwaukee Brewers before moving to St. Louis to become the St. Louis Browns. 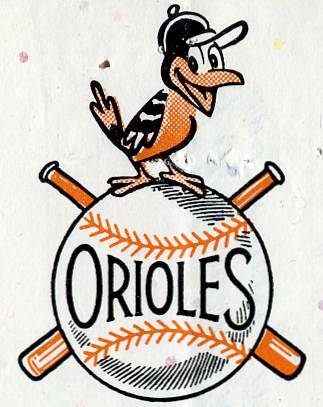 After 52 often beleaguered years in St. Louis, the Browns moved to Baltimore in 1954 and adopted the Orioles name in honor of the official state bird of Maryland. The Orioles name had been used by previous major league baseball clubs in Baltimore, including the American League Baltimore Orioles franchise from 1901–1902 that became the New York Yankees and the National League Baltimore Orioles. Nicknames for the team include the O's and the Birds. The Orioles experienced their greatest success from 1964–1983, winning seven Division Championships (1969–1971, 1973–1974, 1979 and 1983), six pennants (1966, 1969–1971, 1979 and 1983), three World Series Championships (1966, 1970 and 1983), and four Most Valuable Player awards (3B Brooks Robinson 1964, OF Frank Robinson 1966, 1B Boog Powell 1970 and SS Cal Ripken Jr. 1983).